Why Choose the Clinical Mental Health Counseling Program? 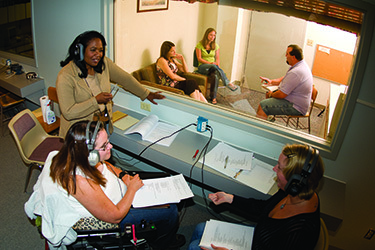 Students learn theories and techniques for counseling individuals, families and groups, and administration and interpretation of psychometric assessment. This major has all the courses required to qualify for admission to the Ohio Professional Counselor licensure exam. The College of Education and Human Services Clinical Mental Health Counseling (CMHC) program is accredited by the Council for Accreditation of Counseling and Related Educational Programs (CACREP) through October 31, 2019. Learn more about the CACREP Accrediation. Note: Students will be evaluated for endorsement by Department faculty for demonstrating, ethical, academic, and clinical competence in the professional orientation. Last year, there were 28 graduates of Wright State University's CMHC program. Our graduates consistently achieve high pass rates on licensing examinations. The pass rate for graduates taking the NCE examination in 2017 was 83%. Of the admitted students, 80% graduate from the program in the expected time period and 63% of those program graduates responding to surveys were employed in the field within six months of graduation. *Represents the percentage of students that graduated within the 3 year expected time frame. Many students exceed this time frame due to balancing full-time jobs and family responsibilities. **Represents the percentage of students who were employed in the field at graduation. 17 out of 28 graduates resonded to request for this infomation. Average of 7 clock hours per week for fall and spring semesters and 9 clock hours per week for summer semester are required for a minimum of 100 total clock hours on site. Of these 100 hours, 40 clock hours are required of direct contact with clients (individual, couple, marriage and family and or group counseling, appraisal and consultation). At least 25% of the direct contact time should be individual counseling and at least 25% group counseling, e.g., it could be 45% individual, 45% group and 10% assessment, or any combination. A minimum of 1 clock hour per week of direct face-to-face supervision with the LPCC-S Site Supervisor is required. The student needs to submit an application (Appendix 1), proof of liability insurance ,an unofficial academic advising report, and a copy of the program of study, by the dates specified below for each semester of CNL 8670. Complete and submit the application (Appendix 2), Counseling Practicum Contract/ Memo of Understanding (Appendix 3) – CNL 8650. Applications and paperwork apply for one semester only-students MUST apply each semester they plan to register for Internship.The student must supply verification of liability insurance at the time of each application. A photocopy of the insurance application and check will not fulfill this requirement. The student can provide a copy of the policy or anything that states their name and the dates that they will be covered by the insurance. Student applications to join the American Counseling Association (ACA) and applications for ACA Professional Liability Insurance are available in 108 Allyn Hall. Students may also join the AMHCA for Professional Liability Insurance. On-Site Requirements Individual and Group Practicum (CNL 8650): The student is required to spend a minimum of 7 hours per week* (for a minimum total of 100 hours per semester) at his/her site; however, a site may require additional hours. Of the 100 hours, a minimum total of 40 hours must involve direct client contact. Of these 40 hours, at least 25 percent (10 hours) must be of individual counseling and at least 25 percent (10 hours) must be of group counseling. The remaining 50 percent (20 hours) may be a combination of counseling: individuals, groups, couples, families, consultation, and appraisal. In addition, 1 hour per week must be direct individual supervision of the practicum student by the site supervisor. For purposes of critique and evaluation, a minimum of one audio or video taping per week is required. Intake interviews alone will not fulfill these requirements. Students have the responsibility for following site procedures, both for securing permission to tape and insuring the confidentiality of the obtained tape. Students are strongly encouraged to exceed the minimum number of required counseling hours per week. Site supervisors must have a master's degree in counseling or a related profession with equivalent qualifications, Ohio licensure as a professional clinical counselor with supervising status (LPCC-S) with the Ohio Counselor, Social Worker, and Marriage and Family Therapist Board (OCSWMFT), and a minimum of two years of pertinent professional experience in the program area the student is completing practicum. *Wright State University’s summer sessions are 12-week semesters. Students registered for Practicum during a summer semester will be required to spend a minimum of 9 hours per week at his/her site, in order to obtain the minimum 100 hours required for practicum. The student is required to complete a total of 6 credit hours of CNL 8670 for a minimum of 600 clock hours at his/her internship site with a minimum of 240 direct client contact clock hours (individual, couple, marriage and family and or group counseling, appraisal and consultation). One credit hour equals 100 clock hours on site.This may be accomplished in one of the following sequences below for the 15-week Fall & Spring semester.The following are minimum internship requirements. • In addition to completing the requirements for practicum, the practicum (CNL 8650) must be completed. CNL 8650 and CNL 8670 Site Supervisor Practicum and Internship Evaluations (Appendix 5). Completed Impact on Client Needs forms that reflect successful interventions (Appendix 9). Graded CNL 9530 Case Conceptualization assignment (this requirement is for Clinical Mental Health Students only). Pedagogical Content Knowledge Strand: CNL 8650 and CNL 8670 Site Supervisor Practicum and Internship Evaluation. Completed Impact on client Needs forms that show successful intervention(s). A minimum of 1.5 clock hour per week of direct face-to-face supervision with the LPCC-S Site Supervisor per week. Students learn theories and techniques for counseling individuals, families and groups, and administration and interpretation of psychometric assessment. This major has all the courses required to qualify for admission to the Ohio Professional Counselor licensure exam (NCE). Last year, there were 19 graduates of Wright State University's Clinical Mental Health Counseling program. Our graduates consistently achieve high pass rates on licensing examinations. The pass rate for graduates taking the NCE examination in 2017 was 83%. Of the admitted students, 80% graduate from the program graduate in the expected time period.